I’m delighted to share an excerpt from the show entitled “RVTs”, my tribute to this wonderful profession. 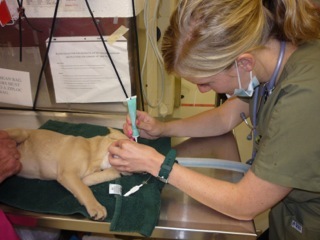 I compare it to my other career as an actress, discuss the ups and downs of this job along with interesting statistics and tell why this is a great time to be a SuperVet Tech. 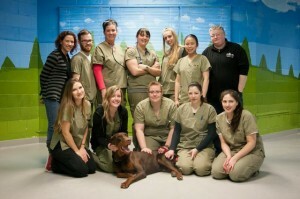 SuperVet Tech Returns! 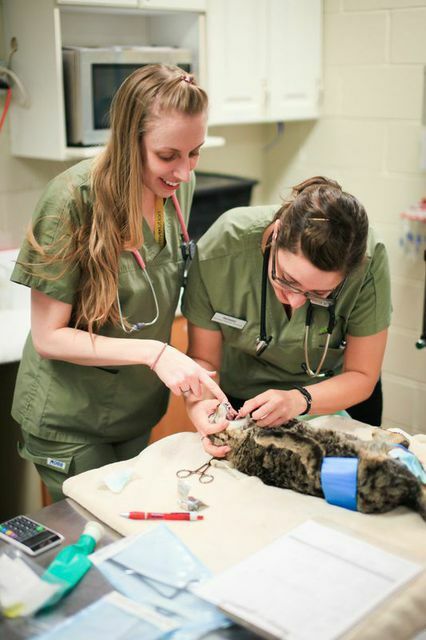 Special price for veterinary workers……. She’s coming back! And the hard-working workers at vet clinics get a special deal! 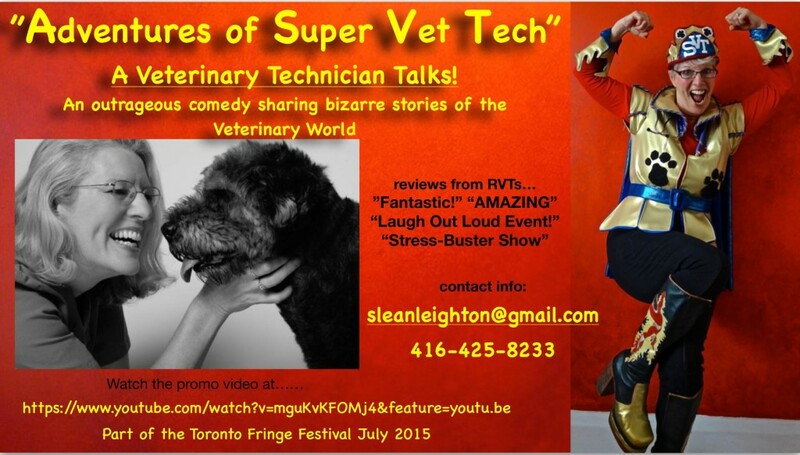 On the heels of a successful Canadian Tour and after gaining rave reviews at the Toronto Fringe Festival 2015, “Adventures of a SuperVet Tech” returns to Toronto for 2 shows only at the Red Sandcastle Theatre, 922 Queen St. East, (at Logan), Thursday June 2nd and Friday June 3rd at 7:30pm. Prices are $20.00Adults, $15.00 Students, Seniors and Veterinary Staff Members. For reservations please call 416- 845-9411. Don’t miss this ground-breaking show, a first for the veterinary world. 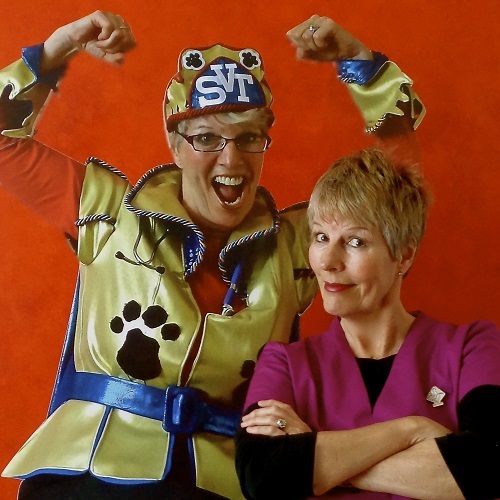 It was a win/win situation at Douglas College, Oct 8th as Sandra Lean-Leighton presented her hilarious theatrical production “Adventures of a SuperVet Tech”. 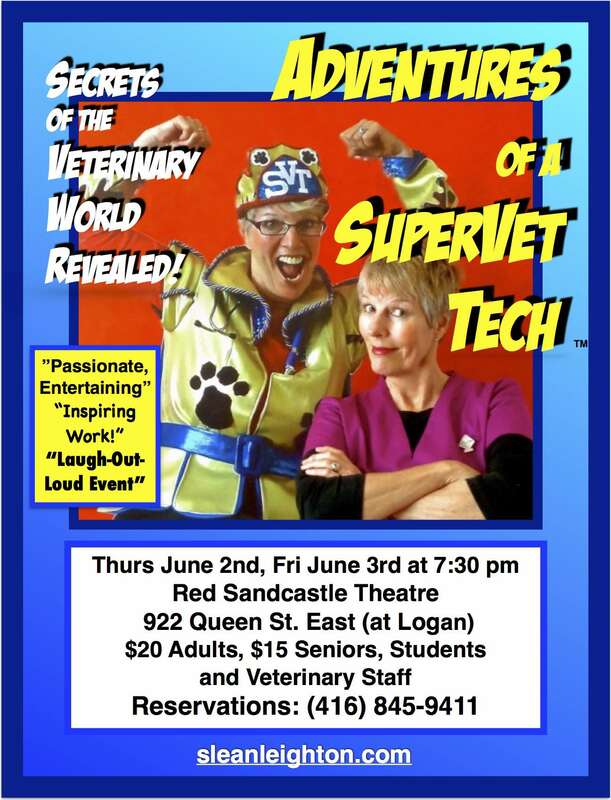 Not only presented as a motivational show for vet tech students, the public were also invited to share in the fun and proceeds from the ticket sales went to a very worthy cause, the VTEC Fund for student bursaries and extra equipment for the program. Sandra Lean-Leighton spent the first two decades of her career in performance, finding opportunities in Canada and internationally, both behind-the-scenes and as an actor. She founded Lilliput Productions, a children’s theatre company for which she wrote, performed, and produced a number of successful shows. Lean-Leighton really gives it her all in this multimedia show, and is unflappable onstage. She’s a confident and warm performer, and able to charm. 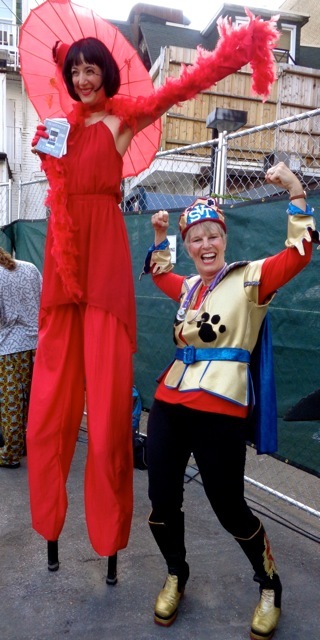 These are skills she likely honed in children’s theatre, and they work just as well here. Indeed, I could see this show playing well to a wide range of ages, so long as audience members are prepared for some gross-out humour and frank discussion of male reproductive equipment. If you require your theatre to be Very Serious and Cerebral, this isn’t for you. Lean-Leighton wears a superhero costume for much of the show, and there are plenty of goofy moments. However, if you’re willing to go with the flow and have some fun, there are laughs to be had as well as things to learn! There are also brow-raising tales, particularly when Lean-Leighton reveals a few of the stranger behaviours exhibited by the more eccentric pet owners she’s encountered. She’s never cruel, however. In fact, there are some poignant moments as she discusses death, dignity, compassion and pain in an understated way that is quietly moving. I wasn’t sure what to expect from the show, but Lean-Leighton won me over with her charisma and commitment. She’s not afraid of a little razzle-dazzle, and I couldn’t help but grin in response. It’s clear she loves what she does – the acting as well as her work with animals – and that adds something undeniable to this show. Adventures of a SuperVet Tech is a delightful production which exceeded my expectations. It is a passionate, entertaining and inspiring work. Some surprises: the amount of technology used in the field by a vet tech; the pathos evoked in the segment about euthanasia, which had a very personal aspect to it; and the description of the CRAZY (her word) pet owners encountered. Fast moving, creative, and a great piece of theatre. The Haileybury Campus hosted a laugh-out-loud event on February 4, 2015, during Student Development Hour. 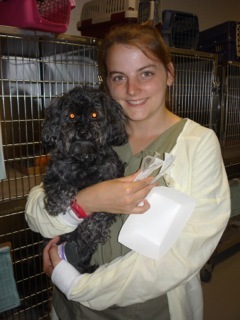 Of special interest to the many Veterinary Sciences students in Haileybury, Sandra Leighton presented her one-woman show, “Behind the Furry Curtain – A Lighthearted Glimpse into the Veterinary World”. The show was presented to a full house, and discussed the topic “What is a Vet Tech?”. Using her twenty years of experience, Sandra has created a hilarious show that discusses some of the responsibilities she has been tasked with during her years in the field. The event was a fantastic stress-buster for our students, and it was enjoyed by all! The Fringe has begun. Last Night, had a wildly enthusiastic crowd at the Al Green Theatre for my opening night of “Adventures of a SuperVet Tech”. Too much fun to be legal. Can’t wait for tomorrow’s show July 3rd at 5:15 pm. To all my Veterinary Technicians. Come and get a special prize just for you. July 1 : 10:30 p.m.
July 3 : 5:15 p.m.
July 4 : 11:00 p.m.
July 5 : 5:15 p.m.
July 12 : 2:15 p.m.
At the venue starting one hour before show.